Forget guitar for a moment - the human mind is itself an amazingly powerful instrument. It can imagine objects before your eyes, authentically recall tastes, smells, sounds and how something feels, all on command. But as a musician the mind can also be utilised for its "inner ear", giving us the ability to internalise and create music. This inner ear plays a significant role in improvisation and songwriting in general. It's about "hearing" something in your head and being able to translate it on to the fretboard. Seasoned musicians will often hear ideas play out in their head before even touching their instrument. That's the inner ear at work. It's about being able to anticipate the next note or chord, or sequence of notes and chords, based on intuition rather than calculation. Unlocking this intuition will enable you to create original music that truly represents and celebrates you as an individual. We just need to train and exercise the part of the brain responsible for the inner ear, as it has perhaps not been used much before, especially in the way we're about to explore. Intervals are simply the distance between two pitches/notes. They are considered the building blocks of both harmony and melody. Each interval has a unique sound. String or stack them together in different combinations and we can convey specific emotions and musical messages. So it makes sense to begin our inner ear training using intervals. Play it several times. Now try to hear it in your head without playing. I'm confident you'll be able to do this with relative ease. Side note: you will need to be in a relatively quiet place, with no background music, to avoid distraction. I'm sure you're aware how difficult it is to recall music in your head when music is already playing around you. Wait a few moments... wait some more... distract yourself for a moment... now refocus the mind and try hearing the movement in your head again. Is it still there? This is known as internalisation. The sound of the movement between the two notes has made a kind of auditory imprint on your mind, which you can then recall in the same way you can recall images or patterns. You can practice this simple exercise with any two notes. I'd strongly recommend going through my interval lessons to ensure you can internalise different note relationships. You can even internalise how you phrase the two notes, for example, a bend or hammer-on, as this affects how they sound. At first, to test the mental imprint of these intervals, it might help to physically play a reference note on the guitar and then use the inner ear to find the second note of the chosen interval. Really get to know how the interval sounds at different pitches. After a few minutes of repetition, pick one of the positions and repeat it a few times to internalise it. Now we're going to do exactly the same "pitch shifting" exercise, but this time try moving the interval up or down in pitch in your head, although they don't have to be the same pitches as you played before. You may find humming or whistling the notes helps at first, but don't touch the fretboard - keep the source of the pitch changes from your mind. This requires that you can take the relationship between the two notes, keep it intact, moving it to a new pitch in your head. Rest at a pitch of your choosing and repeat the sequence several times, in your head, at that new pitch. The repetition will create an auditory imprint. Now try to locate that new pitch relationship on your guitar. Don't expect to hit the correct position right away, or even after several tries, but see if you can adjust until you get it. It's this adjusting that trains your fingers to co-ordinate with your inner ear. It's a challenging exercise at first, but keep at it. 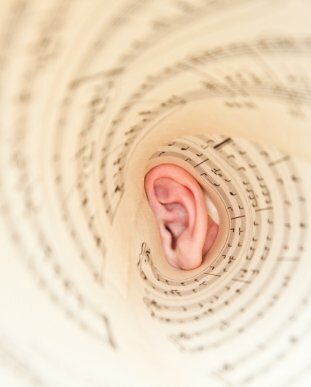 It's not so much about hitting the right notes all the time, but more about activating the part of the mind associated with auditory reference. Already, just by doing this simple exercise, you're activating the part of your brain responsible for the inner ear. It's just like exercising any other part of your body - the more you do it, the more active it becomes, the more efficient it gets. That's right, try to internalise a sequence of three notes instead of two. Then four notes, five, six etc. Eventually, we can get to the stage where entire scales can be internalised. Obviously you'll need to work on learning the individual scales before you can fully internalise them. But as you learn them, don't just focus on where you're putting your fingers - listen attentively to each movement you make. Try hearing the scale in sequence, from low to high and vice versa, in your head. Again, play a reference/root note at first to give your mind a starting point. For example, play the note D and see if you can use your mind to continue through the D minor pentatonic scale. It sounds difficult, but if you know the scale well, the auditory imprint should lead you through it quite naturally. Then, just like before, try shifting them up or down in pitch, first in your head and then finding this position on the neck. You'll be surprised at how quickly your inner ear develops from these simple "pitch shifting" exercises. As mentioned earlier, opening your inner ear will make improvising and writing music easier and more intuitive. But how do we go from merely internalising and repeating music we hear with our inner ear to creating new music from scratch? This is similar to asking how the fragmented human brain can produce a unitary consciousness we call "I" (sorry to get so deep!). In other words, the ability to create new music from the mind is an emergent property of the earlier internalisation exercises coming together. But there are further exercises we can use to help develop the creative aspect of the inner ear. One powerful exercise is to create (or find on Youtube) a simple backing track that you can play a single scale along to. Jam as normal, exploring the scale for ten minutes or so in as many different ways as you can. Now re-play the jam track, this time playing out ideas only using your inner ear. Watch the fretboard as you do this and see if you can co-ordinate your ideas with the pattern. It doesn't matter if you lose the flow, just keep it simple at first - repeating two or three note phrases. 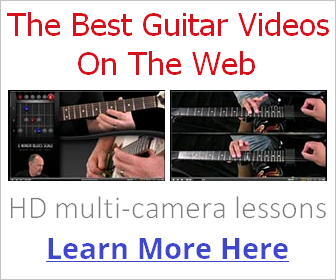 After a few minutes, start to find and play your ideas on the fretboard. The more you do this, the smaller the gap between forming an idea in your mind and translating on to the neck will become. Given enough time (and we're talking weeks, months of persistent training here - you need to be patient!) you will be able to play ideas as they form in your head, or at least near enough. Then it's a case of repeating this process using different scales and chord combos. Whether you're in the car, sat on the bus, walking or laid in bed, you can access your mind's ear at any moment and try to come up with melodies or chord progressions. Sometimes you'll bring up songs you already know - that's fine, but see if you can venture off into something original. When you can "hear" it working, it's an amazing feeling and it makes you realise just how powerful the creative mind is. If you're listening to the radio, see if you can both memorise parts of the song and think a melody around the existing song. You can do a similar thing with TV commercials and make them a far more productive use of your time! It's possible that you can get down an idea you've created in your head as soon as you pick up the guitar, build on it and, hey presto, you have a song in the making. Now, I'm aware this is all easier said than done. But just as walking might seem impossible to a pre-toddler at first, all they have to do is keep exercising those leg muscles, keep trying, keep doing it, no matter what the initial results. The more you access and motivate the inner ear part of your brain, the more sophisticated, responsive and creative it becomes. Keep at it, and the mind's ear will sink into the backdrop of your creative process. It will become just another powerful, yet subtle part of the mind you take for granted!